Drake (Hudson, Ohio), a team captain and one-time All-American, also won the 200-yard individual medley in a lifetime-best time of 2:15.34. It was the second pool record Drake has had a hand in breaking in two weeks. 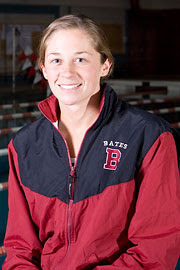 Two weeks ago against Bowdoin, Bates set the pool record in the 400-yard medley relay with a time of 4:06.27.